For the duration of the festival, you can watch the balloons take off in the morning around 7 a.m., and fly again in the evening. All of it is weather dependant, so check in on their Facebook Page before heading out to see them, and also to find the schedule of events. Watching them all take off was pretty cool, especially when they pop up off the ground and you get to see what they look like! 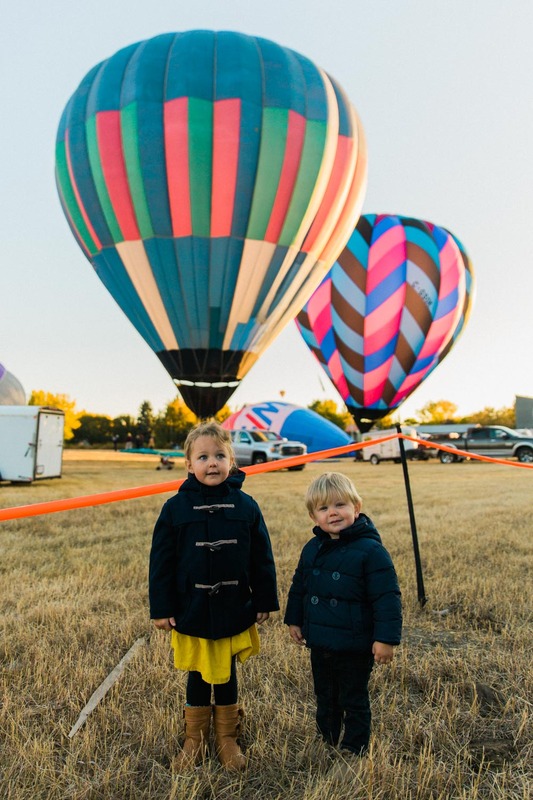 On Friday night of the International Balloon Festival, they host the Glow Night at Spitzee Elementary School in High River. I recommend showing up early to that, last year was so incredibly busy! Festivities start at 5 p.m. and the Glowing begins at 8 p.m. for about an hour or so. Last year the weather was great, so at 5 p.m. we were able to watch the hot air balloons take off again from the school field, we will see what happens this year! While we waited for the Glow part of the evening to begin, we checked out the food trucks that were on site, played on the playground equipment on the grounds, and wandered around High River a bit (if you’re a Heartland fan, you can find the Maggie’s cafe down one of the streets where they film some of the show!). When it starts to get dark they bring all the hot air balloons back to the field and set them up, tethered to the ground. To keep them inflated they use the fire to create hot air, which creates a really cool glowing effect. This is when you can walk in and amongst all of the balloons, it’s so cool! I know it’s supposed to be pretty cold tomorrow for the Glow Night, but if you want to check this out, I would suggest going this time around instead of waiting for next year. Last year there were a ton of people, so with the cold weather you might luck out and have it be a little less crazy. Have fun making memories!